I love this place! Not only because of its fun and friendly atmosphere but because the meatballs are just so damn tasty. 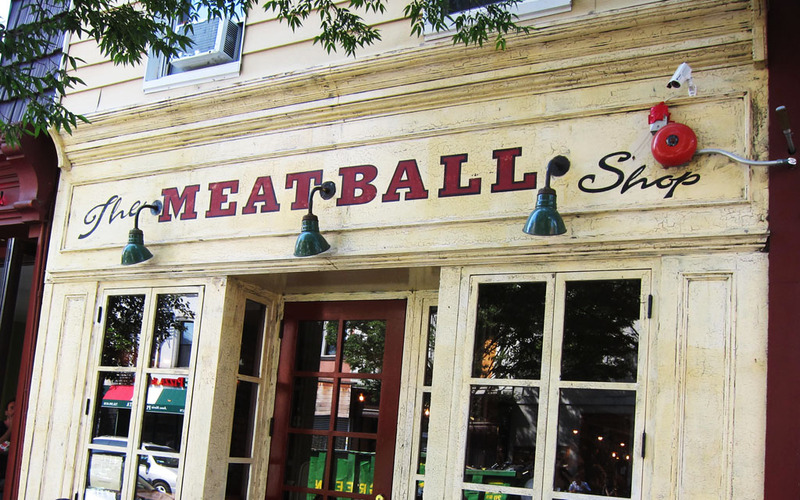 Yes, you must like meatballs to really appreciate The Meatball Shop’s obvious specialty, but then again who doesn’t? And yes, there are vegetarian options too. With four locations around the city and a relatively cheap price tag, there should be no excuse not to go. Three branches lay claim to Manhattan while the fourth fends for itself in Brooklyn. While each branch has its own individual style and ambiance (exposed brick in one, photos and prints of yesteryear hanging on the walls in another) they all share a common setting of industrial chic dining. A few small, individual tables are housed in each restaurant, as the seating is mostly communal and often shared along a large wooden table. There is also plenty of seating at the bar. Pull up a stool at the Williamsburg branch and you can watch the chefs hard at work as the bar doubles as a meatball prep station. Laminated menus and marker pens allow diners to customise their own meal by ticking off what type of meatballs they want, as well as their complementing sauce and side. The menu boasts a variety of meatballs to choose from: classic beef, spicy pork, chicken, vegetarian and a constantly changing special. Sauces include: classic tomato, spicy meat, mushroom gravy, parmesan cream and pesto. Then there are a dozen side options to choose from, including: pasta, mashed potato, risotto, sautéed broccoli and steamed spinach, to have either on the side or under the meatballs. 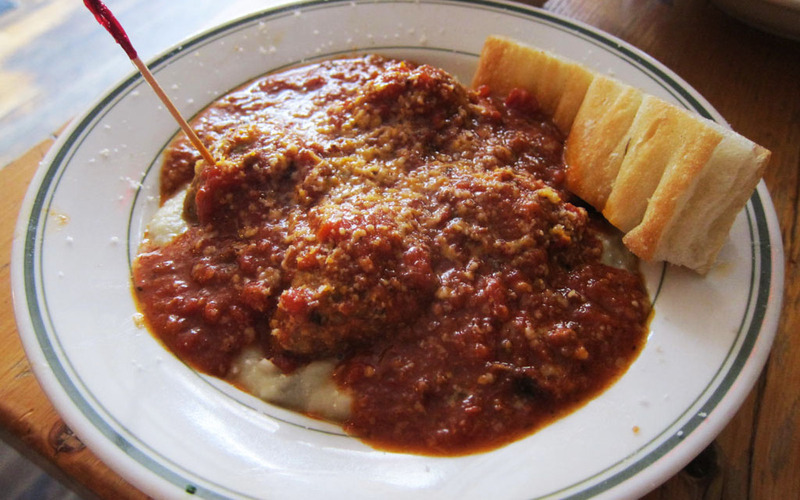 My favourite combination is the classic beef meatballs, smothered in a spicy tomato sauce on top of a generous serve of mash. Simple but delicious! Make sure to leave room for dessert. The home-made ice cream sandwiches are hands down the BEST in town! Again the menu allows you to build your own. 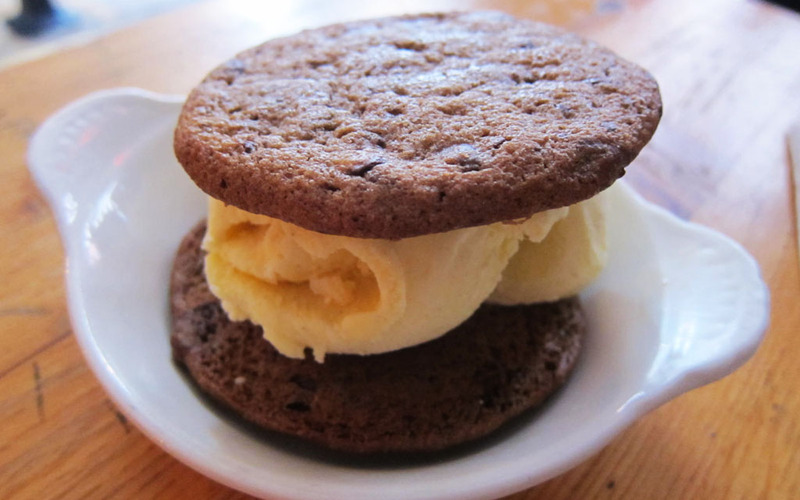 My recommendation is a scoop of the vanilla bean ice cream sandwiched between two freshly baked choc chip cookies. Absolutely divine! Just writing about them makes me want one. If only I didn’t have to take the G train to Williamsburg to get there. With no reservations I suggest going early to The Meatball Shop, as they do tend to fill up quickly. Though not always an option, the next best thing is to just turn up, put your name on the list and then depending on how long the wait is go and grab a drink elsewhere beforehand. You're making me hungry. STOP IT. No reservations. Multiple locations. Check website for further details.